About "Modeling decimal multiplication worksheets"
Worksheets on modeling decimal multiplication are much useful to the students who would like to practice problems on multiplication. 4. The side of a square is 3.2 cm. Find its perimeter. 5. The length of a rectangle is 6.3 cm and its breadth is 3.2 cm. What is the area of the rectangle? 8. The price of a fruit is $3.52 per lb. Find the cost of 10 lbs of fruits. 9. A person walks regularly in the morning. If the speed of his walking is 43.26 ft per minute, Find the distance covered by him in 100 minutes. 10. One-thousandth of a certain number is 0.003. What is the number ? 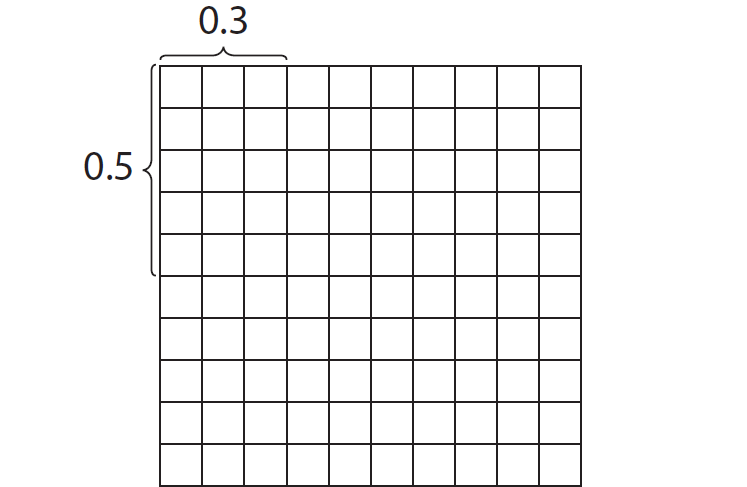 To multiply 0.3 and 0.5, let us consider decimal grids given below. 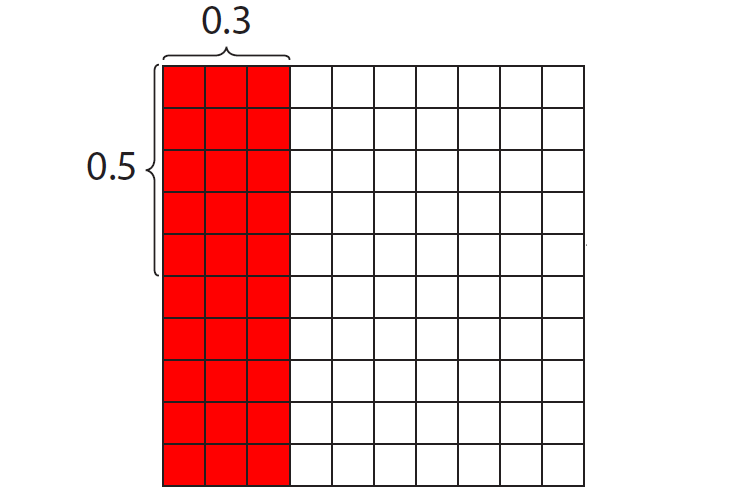 0.3 × 0.5 represents 0.3 of 0.5. Now shade the common region of 0.5 and 0.3 in blue color. 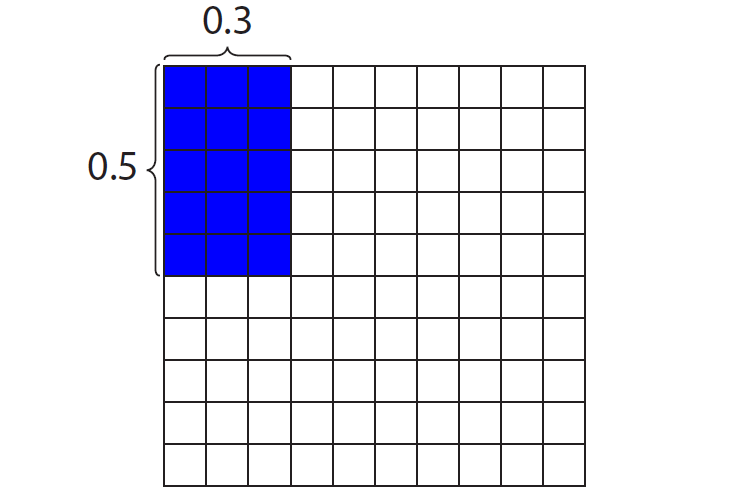 In the common region of 0.5 and 0.3 in blue color, there are 15 squares. This represents 15 hundredths or 0.15. 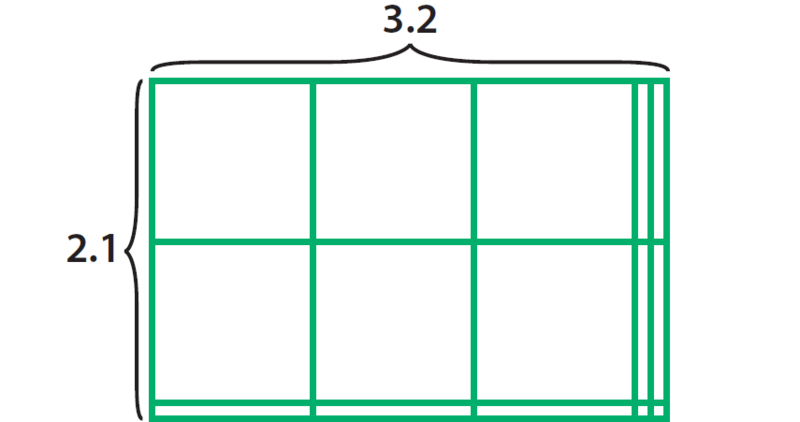 Let us use area model to multiply 3.2 and 2.1. 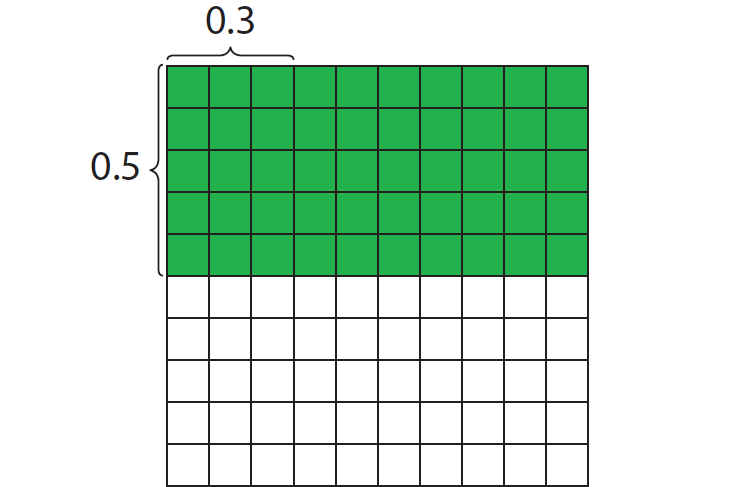 In this model, the large squares represent wholes, the small rectangles along the right and lower edges represent tenths, and the small squares at the lower right represent hundredths. This model is 3 and 2 tenths units long, and 2 and 1 tenth units wide. Imagine the given decimals as whole numbers. Then, we have 23 and 178. Now, multiply 23 and 178. In the first decimal 2.3, there is one digit after the decimal point and in 1.78, there are two digits after the decimal point. In the above result 4094, there must be 3 digits after the decimal. We multiply by 3.723 by 100. So, we have to move the decimal point two digits to the right. We multiply by 3.723 by 1000. So, we have to move the decimal point two digits to the right. The price of a fruit is $3.52 per lb. Find the cost of 10 lbs of fruits. We multiply by 3.52 by 10. So, we have to move the decimal point one digit to the right. A person walks regularly in the morning. If the speed of his walking is 43.26 ft per minute, Find the distance covered by him in 100 minutes. Given : Speed is 43.26 ft per minute. So, distance covered in one minute is 43.26 ft.
We all know the formula for distance. We multiply by 43.26 by 100. So, we have to move the decimal point two digits to the right. Hence, the distance covered by him in 100 minutes is 4326 ft.
One-thousandth of a certain number is 0.003. What is the number? Let "a" be the number. We multiply by 0.003 by 1000. So, we have to move the decimal point three digits to the right. Hence, the the number is 3. After having gone through the stuff given above, we hope that the students would have understood "Modeling decimal multiplication worksheets". Apart from "Modeling decimal multiplication worksheets", if you need any other stuff in math, please use our google custom search here.